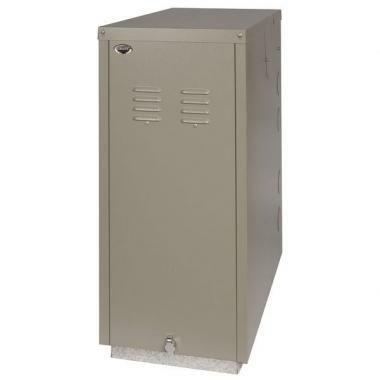 The Vortex Pro External Regular oil boiler is a condensing floor standing unit that has been designed and manufactured by Grant to be installed outside. This a unit is compact in size and has been produced with simple and quick installation in mind as there is no complicated wiring or plumbing. This should help to save you time and money when it comes to installation. As a regular boiler it needs to be installed as part of a heating system alongside a hot water storage cylinder, cold water storage tank and a feed and expansion tank. This means it is not really suitable for smaller homes. This boiler has an efficiency rating of 91.9% making it an A rated boiler. This boiler has an output rating of 48-58kW making the unit perfect for the larger homes with a higher demand for heating and hot water. Key features of this boiler include an optional sealed system kit, a unique Grant Vortex stainless steel heat exchanger and a pre-fitted low emissions Riello burner. It also includes a built in test switch and a frost stat to protect the unit in both inactive summer months and the winter. This boiler is part of an award winning product range with other outputs ranging from a 15kW to 70kW. This boiler also comes with a 5 year warranty as standard to give you peace of mind that this boiler will not let you down.